At a briefing organized by Communications Workers of America and the Committee for Better Banks in the Rayburn House Office Building, a panel of front-line bank workers and representatives from Americans for Financial Reform (AFR) and the National Employment Law Project (NELP) discussed the banking industry’s growing use of aggressive sales quotas and their dangerous consequences. The event marked the release of a NELP report, Banking on the Hard Sell: Low Wages and Aggressive Sales Metrics Put Bank Workers and Customers At Risk. 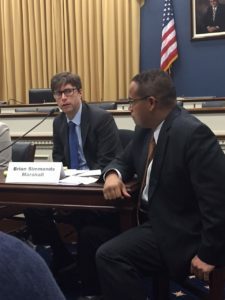 The panel was convened by Representative Keith Ellison (D-MN) and drew a capacity crowd that included several members of the House Progressive Caucus. 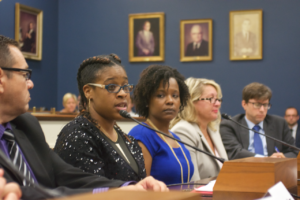 The bank worker panelists, representing varied regions of the country and a number of large financial institutions, told similar stories about the toxic work environment created by practices designed solely to provide maximum profit margins for the banks. Khalid Taha, an Iraqi immigrant to the United States, imagined his job with Wells Fargo as the fulfillment of the American dream; but it turned into a nightmare, he testified, when the cumulative pressure of persuading multiple customers to open new banking accounts every day led to his hospitalization for exhaustion. The bank employees spoke of their commitment to quality customer service and their dismay at being compelled to engage in transactions they knew would result in great financial damage to consumers. Modern bank teller positions are entirely “sales oriented,” said Oscar Garza, who worked at JP Morgan from 2010 to 2012. Garza testified that he and other JP Morgan workers were instructed to open new accounts at “any cost” and even to falsify financial information to help customers qualify for loans. Similarly, the bank employees explained that quotas and incentives mandated by corporate offices tacitly encourage deceptive behavior. Cassaundra Plummer, formerly an assistant sales teller at a Maryland branch of TD Bank, remembered her manager’s instructions to “only focus on the positives” rather than fully explain the terms of the financial products she was supposed to be selling. Banking on the Hard Sell includes many more personal accounts like these. Caitlin Connolly, the Coordinator of NELP’s campaign on sales quotas, emphasized the need for additional regulations to address the issue of aggressive bank sales tactics. The 2008 financial crisis stirred significant public discussion of the behavior and business practices of big banks, Connolly noted; but attention hasfaded since then, she said, with bad implications for bank employees and consumers alike. A majority of the bank employees at the hearing said they had no knowledge of the consumer protections and other provisions of the Dodd-Frank Act – the landmark financial-reform measure enacted in the aftermath of the 2008 financial crisis. management of front-line bank workers. Financial oversight agencies, Marshall said, should not just be looking for violations of the rules, but for the root causes of those violations. Following the briefing, bank employee panelists, along with AFR and NELP staff, held individual meetings with regulators at the Office of the Comptroller of the Currency and the Consumer Finance Protection Bureau to further discuss the issues raised at the event.